Neilson's at Cannon Beach is one of the original beach cabins, owned by the Neilson family for over fifty years. Located in front of Haystack Rock, the view doesn't get any better! 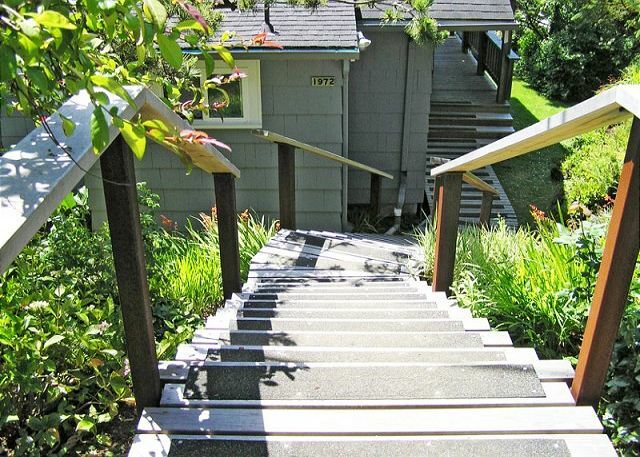 Follow twenty stair steps down to reach the front door of this classic beach house. Oversized windows in the living room and dining room capture a breath-taking ocean view. The large, brick fireplace warms the living room on a cool evening, the wood provided by the owners. Recently refinished old growth Douglas fir floors provide comfortable footing and that traditional charming cabin feel. While the living and dining areas maintain the coziness of days gone by, the brand new kitchen remodel is top-notch. Beautiful new stainless steel refrigerator and gas range with sea-blue tile backsplash throughout, makes cooking with a view a whole new experience. Off the kitchen the laundry room includes a new washer and dryer, and an additional second refrigerator. The King master bedroom has an adjoining private bathroom. The second Queen bedroom and the third bedroom with two Twins, have access to the main bathroom. 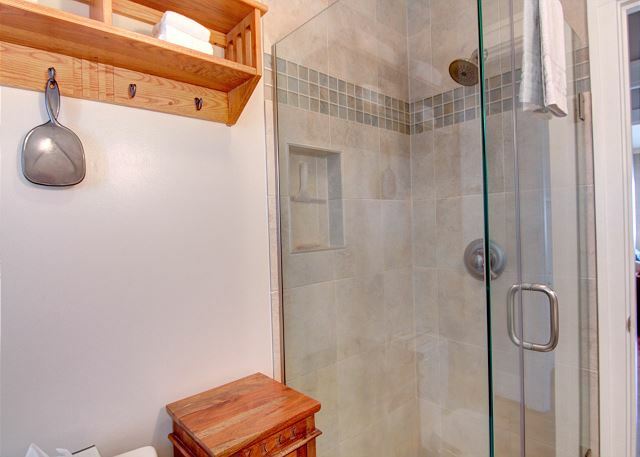 Recently remodeled, both baths feature custom tile showers. Following a dip in the ocean, kids will love a warm soak in the traditional clawfoot tub. The enclosed shower is separate from the tub. The deck off the kitchen is perfect for watching sunsets and barbecuing the catch of the day. Sand toys and deck chairs are available in the northeast corner of the shed, located on the south pathway. The south pathway also may be used in lieu of the stairs to the house. The path leading to the beach is shared with the log cabin next door. 7-night minimum stay during summer months with a Saturday arrival date. "The view from the windows was amazing!" 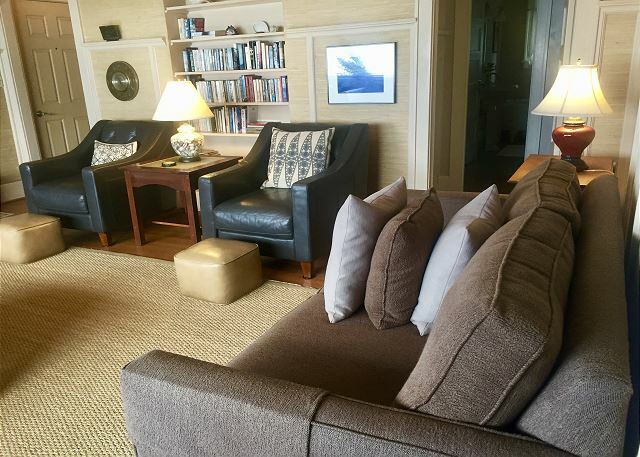 "The location with a view of Haystack Rock was exceptional, and the home was in excellent condition and had all the amenities one could imagine." We are very happy to hear you enjoyed your stay, come visit again soon. Thank you! Come visit again soon! "Great house and location, well stocked." "Great working kitchen. Awesome location. House really feels like a home." "The view at this house was incredible! Location was excellent." "The house is older but well appointed, and you cannot beat the location. Kitchen is remodeled and so cute. Over all this was a wonderful house, and I will definitely stay there again." "The lovely home and its marvelous views. " "We love coming to one of our favorite places and staying ar Neilson's at Cannon Beach makes it great. This wonderful original 1950's Beach bungalow has be updated with beautifully modern bathrooms and a recently remodeled kitchen that is a joy to cook in with a fantastic view of haystack rock and the beach! They amazing views from the living room, dinning room and kitchen make it so delightful even when you are inside watching the winter storms blow by. And when the sun comes out or the rain stops, the short walk down the beach to the rocks is enjoyed by old and young alike. The house is always very clean, has all the necessities in kitchen and bathrooms to make your stay comfortable, and everyone sleeps wonderfully in the comfortable beds listening to the sounds of the waves! This is our go to choice of places to stay when we come to Cannon Beach!" "This is our 4th year and what a wonderful surprise to see the remodeled kitchen, utility & windows. It was/is such a cozy comfortable home & now even more so. You can't beat the location and we've always come away refreshed. Thank you for sharing such a great home! " "Fantastic as always a lovely retreat"
"The kitchen has just been remolded and it is great! This was our third visit to the Neilson's house and the new kitchen made it even more enjoyable than before. " "Our 3rd year was as good as the first. This is a cozy relaxing retreat for our girls getaway. Clean, comfortable, and so accessible to the beach. The wi-if went down and we called the management and they had us up an running quickly. They even offered to come and fix it , but it wasn't necessary. We would like to return again and again. 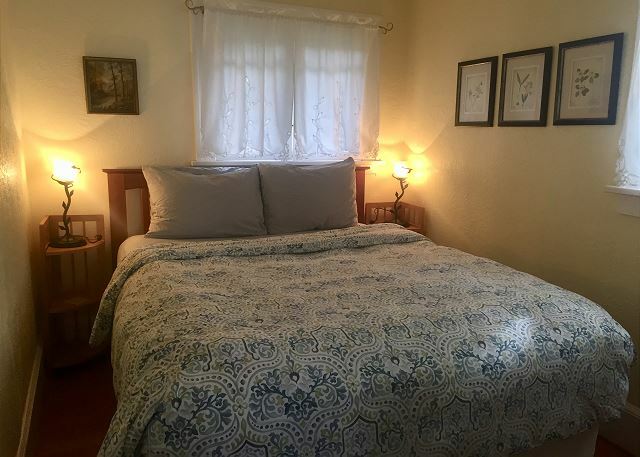 "Right In Front of haystack rock and easy walking distance to town using the beach or road. How could use a few updated windows in the dining/ living room to allow more air flow during warm afternoon. House has great views and is well stocked." "We were renting the house for the third time. The location is perfect, the view spectacular: quite simply, it is hard to match. I found Cannon Beach (the town) more crowded than in the past - probably in part because the weather was so reliable this year. Otherwise, it is difficult to find anything to complain about. " "We were so excited to return to Cannon Beach for our grandson's first ocean experience. Our grand daughter loved the ocean at this age as well. The weather did not disappoint us as 3 of our 5 days were gorgeous.. And who goes to the ocean not expecting a storm. Our house was cozy and felt like home.. Loved the fireplace. We will definitely be back. Our kids say they don't have to search for another vacation home. This one is IT!!!" "This was our third stay at neilsons once again it was always fully equipped but loungers for the deck would have been a bonus. We will be back our stay flew past! "we loved our stay at Neilson's - quaint old world cottage with gorgeous bathrooms and the view is to die for. If i had one suggestion I'd love to see more comfortable couches in the living area, especially the sofa near the window." "We've rented several beach homes in Oregon over the last 10 years. Neilson's is the best location on the best beach on the Oregon Coast. 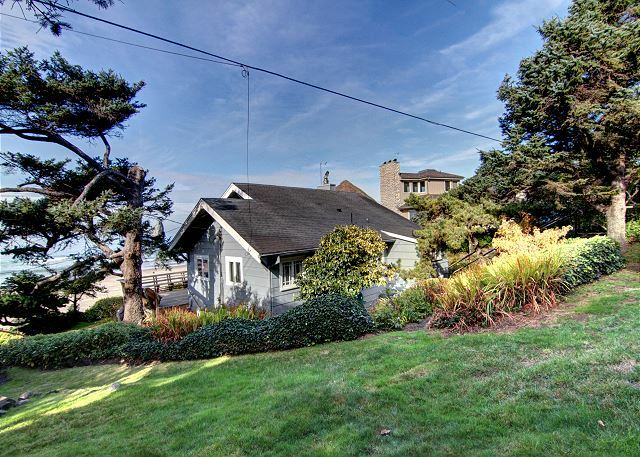 The house is comfortable with a great view of the Pacific Ocean and Haystack Rock. This is our third time at this house and we will be back. CBPM is aways helpful and it is a pleasure to do business with them." "The house was cozy and had the most incredible view. It will make it hard to stay in Cannon Beach anywhere else. Loved it." "Great location with a fantastic view and easy access to the beach. 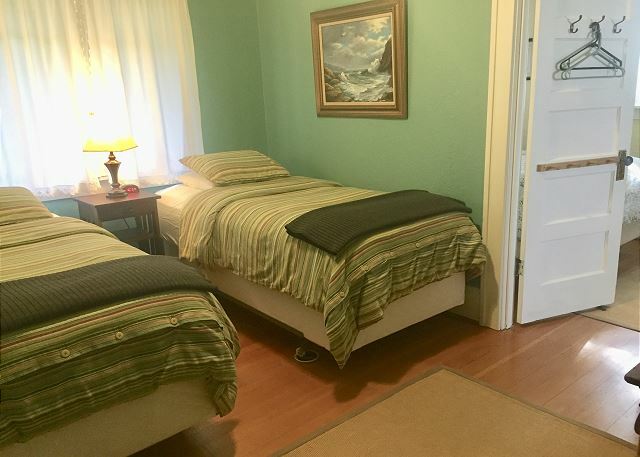 House was well maintained, very clean and the king bed in master was really comfortable. New shower was great also. I came in after hours and picked up my keys etc from the lockbox, so check in was a breeze. The weather even cooperated! It was a great time with a great location. Would stay there again in a heartbeat." "We are returning guests and enjoyed it as much as last year. It's a cozy, warm, clean and comfortable home with spectacular views! Our ladies weekend was so relaxing and fun! We are so impressed that we booked again so we can get our time set now. I think word is getting out about this lovely place. You'll not be disappointed. The property management was very curtious and helpful in trying to locate something I thought I'd left behind. We're very pleased with our entire experience. " "This was our 3rd visit to Neilsons. We love this property, amazing view and all the amenities the home offers. Great beach access (up and down a hill) for days on the beach and bonfires at night. Washer and dryer, gas grill and fully stocked kitchen. They have thought of everything to make this a comfortable home. Unfortunately we left disappointed on this visit since we were woken up on two different days by very loud yard maintenance (blowers/lawn mowers). I realize the property needs to be maintained but for $500+ per night, coordinating yard work during check out days/times seems warranted. We have mixed feelings about returning." "Wonderful rental place - as comfortable and nice as our last trip, 18 months ago!" "Always a perfect vacation at the Neilson's house. Perfect location and perfect home." "This is the fourth or fifth time I've stayed at Neilson's and it was as wonderful as ever. 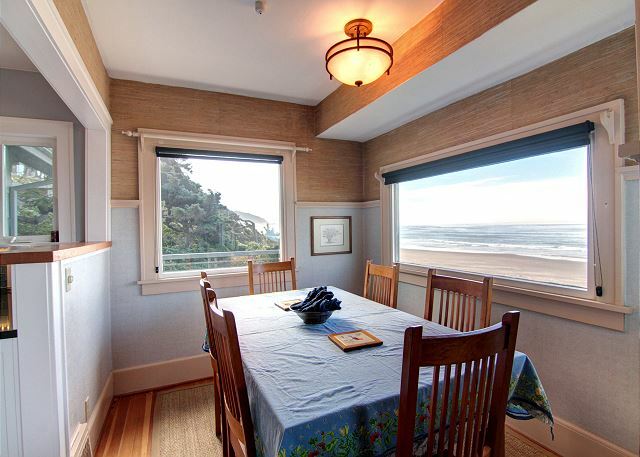 This house is so comfortable and the views of Haystack Rock and the coast are breathtaking. Certainly a wonderful way to wake up every day!! I would recommend this house over and over again and Cannon Beach Property Management makes the whole process very easy. We did have a small problems with the screen door that leads to the deck and had to call. Linda with Cannon Beach Property Management came right over and was able to take care of the problem. I will be back again and again!!" "We love this house. Very comfortable, excellent location and excellent property management team." "This was everything we hoped it would be for a girls week get-away. Would recommend it to anyone who wanted comfort, good location, and good beds. We had a wonderful time and would definitely come again. " "stayed here before and have already signed up for next year"
"The house was lovely, the location couldn't be better, and the rental was managed very efficiently. The only reason I have not given full marks is that my expectations were in line with the very high rent." 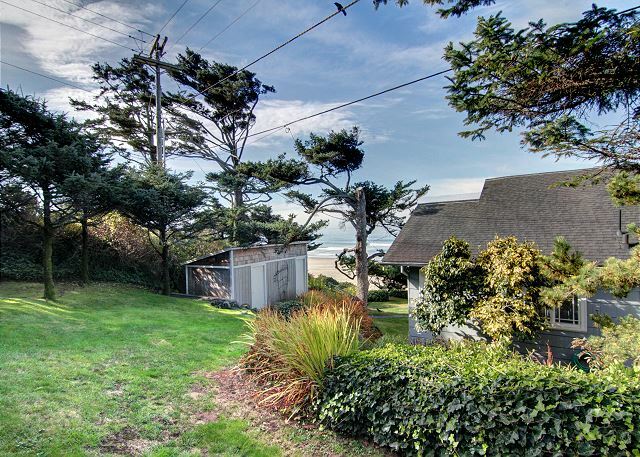 "Great location with a beautiful view of Haystack Rock. 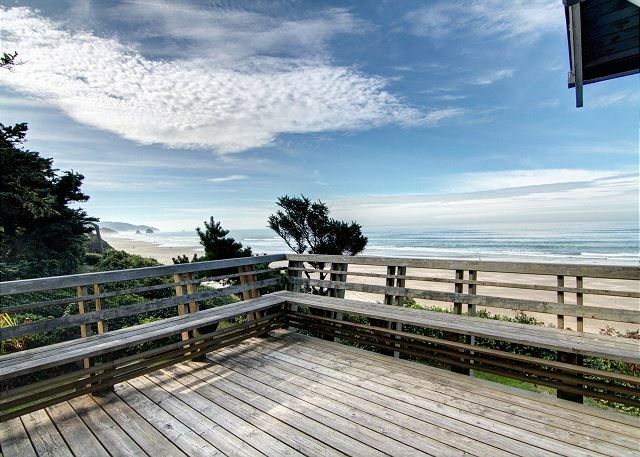 Easy access to beach and centrally located to the town of Cannon Beach and other beachs. The property was well appointed and the kitchen had all the utensils needed." "Overall an excellent home in a great location. Loved watching the sunset from the deck and exploring Haystack Rock at low tide. Beach towels and toys would be a great addition for guests but otherwise we had everything we needed and more. Loved our time in Cannon Beach and looking forward to visiting again!" -The reservation process seems overly bureaucratic"
"We had a wonderful time at the coast. This property feels like a second home, even if just for a long weekend. We really liked the new window treatments in the living, dinning and master bed rooms." "Location is perfect! This was our second visit to Neilson's and we hope to be back soon." "Our second stay at Neilson's in two years. This time was just as wonderful as the last. The location and view are awesome. Just being there and taking in the sight of Haystack rock and the Pacific ocean make me feel like I have no responsibility at all. I just have to decide to walk on the beach or not." "Neilsons at Cannon Beach is a beautiful home in a perfectly scenic location adjacent Haystack Rock. Everything about the home is welcoming. It's decorated tastefully and appointed with everything a vacationer wants to find - including comfortable and attractive furnishings, charming art on the walls, plush bed and bath linens, a kitchen stocked with all the tools a competent cook needs, a box outside the front door (and a garage) full of firewood, and even a pair of binoculars on the windowsill. The home was spotlessly clean when we arrived and we settled in easily. The grounds around the home are very well maintained and add to its charm. Access to the beach begins at the propertys edge via a private path equipped with steps and handrails. The rental staff remembered my request to have an outdoor grill ready for us so we could cook fresh seafood during our visit and that was thoughtful. Our stay at the Neilsons at Cannon Beach home was wonderful. I happily recommend it to others. -Appreciate the new glass and bar wear, especially the wine glasses. -Fire place supplies lacking-no kindling, no newspaper, no fire place lighter, the matches were so old that they would hardly lite or stay lite. -Spot light outside the master bedroom stayed on all night every night. It was like having the sun shine on the window, dificult to sleep with so much light. Need light to go out when not in use or put in pull down shade in window to block light. "My recent stay in November was the second visit to Neilson's. The view is unsurpassed and the location perfect. With the main living areas of the house oriented to the west and south, this is the perfect place to relax in peace and quiet. I greatly appreciate the Neilson family sharing such a treasure and will surely return." 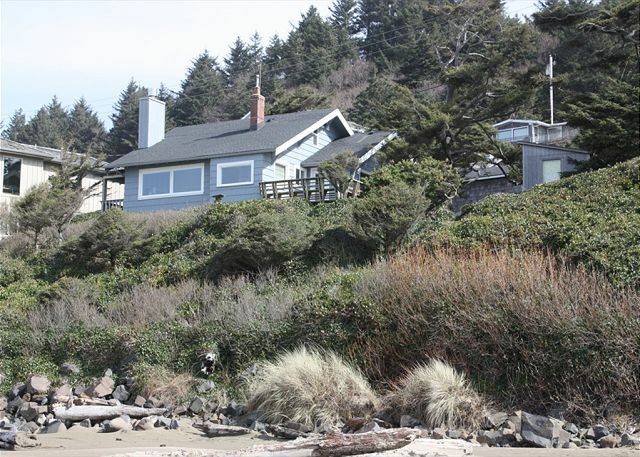 "Great location with wonderful views of ocean and Haystack rock. Property needs some upgrades, most especially the kitchen. Living room furniture is miss-matched and showing lots of wear and tear. Bedroom throw rugs are dirty; gross to look at and walk on." "Five "girlfriends" from high school enjoyed our stay very much. The southwest facing deck was a perfect place to enjoy a glass of wine and watch the sunset. Haystack Rock has great tide pools to explore. On the weekend naturalists are there to visit with about the sealife." "It was wonderful as always, thanks again for everything!" "Really couldn't have been more perfect..."
"Love this house. We have stayed here several times and just love it. It is an older home with lots of history and a glorious view! The Nielsons have owned the property for about 70 years. Nice special touches and the home is fully equipped for cooking. I highly recommend this property." "Great vacation once again, just noticing the property is starting to weather a bit, with the stairs leading down to the cottage and the cottage deck. Both elements had places on the wood where the supports were rotting which wasn't a problem now, but in the future it could be. I'd hate to see aboard break and someone fall. That's it, we look forward to visiting again in 2013! "Wonderful house with an absolutely stunning view of haystack rock from the deck / living room windows. Close enough to town to walk to restaurants / shops, but far enough away to avoid crowds. Would absolutely recommend the house and hope we are able to rent again when we return." "I would recommend to anyone to stay at the Neilson House on Cannon Beach. It was a very beautiful beach house and well taken care of. My family absolutly loved it. It was located right in front of Haystack Rock and the view was absolutly beautiful. I deffinatly plan on renting the Neilson'Beach House again in the future and will recommend it to everyone that I know. 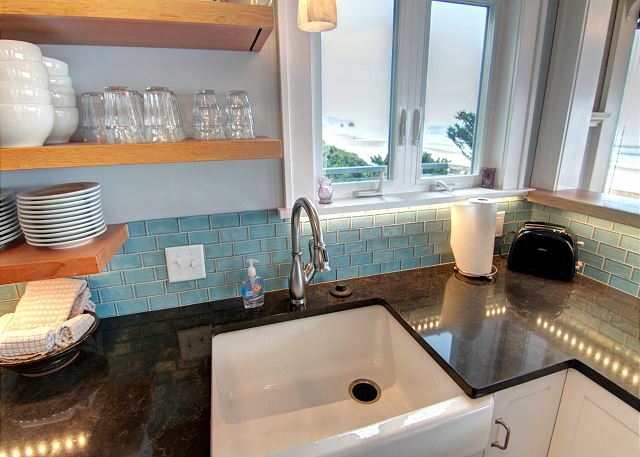 Thank you Cannon Beach Property Managent for such a good rental experience. " "You could not ask for a better location and the view was breath taking. Made each morning you walked into the living room a wondrous experience." "We thoroughly enjoyed our stay at the Neilsons Cottage. It was beautiful and restful and equipped with everything we could possibly have needed! We enjoyed marvelous weather and even a rainbow on the first morning! Cannon Beach was lovely and our cottage was perfect! The staff at CBPM were lovely and very helpful. Delightful Visit all around!" "This is such a great cottage for the family to stay at. Authentic beach cottage with modern conviences. Loved the history that went along with it. Very private quiet location with private beach access and the VIEW!" "The property was everything I expected and more. We felt as if we were staying in a friend's home. The personal belongings such as enscribed hard back books, vases, artwork all were too numerous to describe. The only negative was that the firewood was either green or wet as it simply smoked up the house and created no warmth at all. Otherwise, perfect." "We arrived Friday afternoon and it the Moe's in Tolovanna for a quick bowl of chowder, then unpacked and went for a stroll on the beach, it was windy but fun as a storm was brewing. Had dinner at The Irish Table. The food and service could not be beat. Our waiter was a dear! Sat had a nice breckkie at the house before a walk on the beach and storm hit. The hail was great, so too the waves and wind! Had a wonderful dinner at Newmens, the home for a fire and a movie. Plenty of wood made it easy for fires! Sun was sunny so went for a hour beach walk and kicked around town, then dinner at The Stephanie Inn. Amazing servie and food. All and all a very relaxing yet fun time!" "Lovely property, nicely maintained and furnished, great view. Too far from town to walk on the road, but easy walk to town from the beach. Just right for a quiet long weekend." "I came here with my family for a few days and had a great time. The house was clean, well stocked, and cosy. I will be back!" "We took our 3 month old on his first vacation to Cannon Beach, our favorite get away. This house is very homey and cozy, perfect for a family vacation. The location is fantastic, the views are just amazing. The only thing that would have made this trip easier is having the keys available at the house instead of needing to go to the rental office first and for check out. The best part of the house (besides the view) is the wood burning fireplace and endless amount of wood. " "Our 4 night stay at Neilson's was simply TERRIFIC. The only area in which I give it less than 5 stars is 'cleanliness' as the carpets in the living/dining area have soil spots (although EVERYTHING else was very clean)and it's apparent the little house has been enjoyed by many. We had my sister and her husband from North Dakota visiting with us and they, along with us, fell in love with Cannon much so they are currently looking for property to purchase in the area. We plan to return to Cannon Beach as often as possible which may turn out to be more frequent than we originally thought." "Very nice location on the beach. affordable considering its location. Amenities were nice, some of the best kitchen utensils I've seen in a rental. Fire place with a stocked woodshed was an excellent bonus! Go ahead, book it.....just not when I want the rental myself." "Excellent location on Cannon Beach with great views of the ever changing beach. It is a nice beach house with some history. If you want a place to relaxe and enjoy the natural elements - this is it." "A lovely little house in a perfect location with the most spectacular views! I will definitely try to return." "cable did not work or we did not know how to work it. other than that, it was great"
"Property managers were very helpful. This is a great place to stay." "This was our second stay at Neilson's awesome house. Two years ago, five of us celebrated a friend's retirement here and loved this place. So this time we brought our sons and their wives for a mini-vacation. We hiked Ecola, studied the tide pools, ran and rode bikes on the beautiful beach. Hope to be back sometime soon!" "Recently spent 8 glorious days at Neilson's on Cannon Beach. THe house was wonderful with spectacular views of Haystack Rock. There were three of us staying at the house and we had plenty of room. Wine and cheese at sunset on the spacious deck was incredible. I'd definitely stay again and hope to plan a trip with my family." ""Welcome to our Beach House. Time spent enjoying the view is not deducted from ones life span." This quote might help some explain their stay at Nielson's, and why they will need to return." "Wonderful home with a fantastic location and view - perfect for the two of us"
"Great Location, nice traditional beach house. Exactly what we were looking for." "Great location, very quaint, can't beat the views. We will definately return to this house in the future." "Had a wonderful time. Plan on renting this fine place again." "We had a fabulous time for a second winter getaway while my husband was working at a conference in Seaside. You can't beat the view and the house is cozy and perfect for our family." "It's a quick walk down to the beach but it's hard to leave this cozy house with the spectacular view! We will definately go here again." "This was a great house. It's also very kid-friendly. We were travelling with an 18 month-old and a 3.5 year old and there really wasn't much they could break or "get into". Lots of toys and books for them were already there - and the single floorplan was nice. Bedrooms very comfortable and great bathrooms. No complaints at all, I hope I get to return some day." "I rented Neilson's for a long weekend with my girlfriend and left with a fiancee. Though the home could easily accomodate a large family, it was perfectly comfortable for two and was a great alternative to the overpriced hotels with the invaluable comfort of privacy. For a comparable dollar amount, why stay in a tiny hotel room when you can have an entire home that includes a beautiful deck, bbq, living room, steam showers, fully equipped kitchen, jaw-dropping views of Haystack Rock and a guaranteed VIP parking spot? If you are thinking about staying oceanfront at Cannon Beach and are looking for a unique experience, you must check this place out. It is worth every penny. " "well maintained ocean property. nice little touches such as plenty of spices and paper products.nice dishes.i forgot my meat thermometer, and lo there were two.nice gas grill. loved the deck and location.private entry to beach. well done." "We escaped to the beach for a long weekend to celebrate birthdays with family and friends. The house layout/location couldn't have been better! It was hard to leave and we will return again in the future! The property management company was fantistic to work with and we would highly recommend them. " "I live in Southern Cal and bring my grandmother up to Cannon Beach once or twice year as a tradition. We have stayed all over Cannon Beach, but Grams is now 93 and we are careful in reserving a home that's easy on her body. We had not booked the Neilson house before. The location is spectacular! 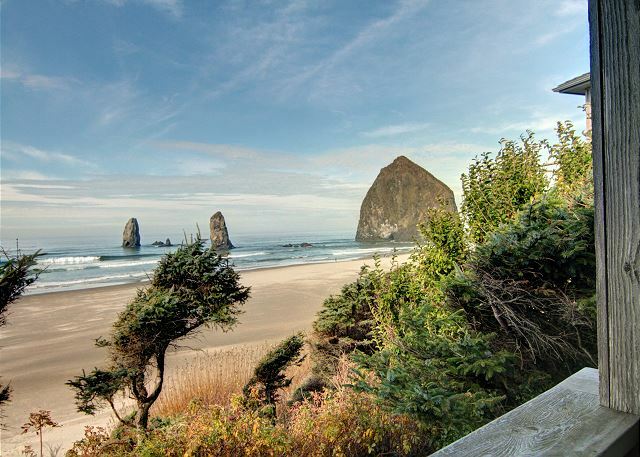 The view of Haystack is one of the BEST in all of Cannon Beach. The 20 steps down to the home from the parking spot were very easy and no trouble for Grams, and our strolls down the lovely trail to the sand were very easy as well. The cottage is one level which is perfect for us. It has SO much charm and historical significance, we loved it. In addition, the new bathrooms, refurbished floors and new interior paint lend a clean update, a bit of luxury and modern amenities that made this property ideal for us. Side note: my family has been coming to Cannon Beach since the 1950's. We have always loved the history and we can spend countless hours gazing at the Governor's house (which is next door to this property) as it so perfectly embodies the history and spirit of Cannon Beach. To be able to share the beach path with that grand home and to sit with family and view that property from the deck was wonderful, like a trip back in time. We loved the home and we'll revisit as often as we can. " "It was a great expierence to stay at Neilson's. Beautiful location, lovely interior, well-stocked kitchen. The only problem was having to leave. " "Everything was perfect!! One very small suggestion would be a few inexpensive storable containers. We will be back! Thank you so very much!" "Three friends celebrating our 40th birthdays. We had a great time. 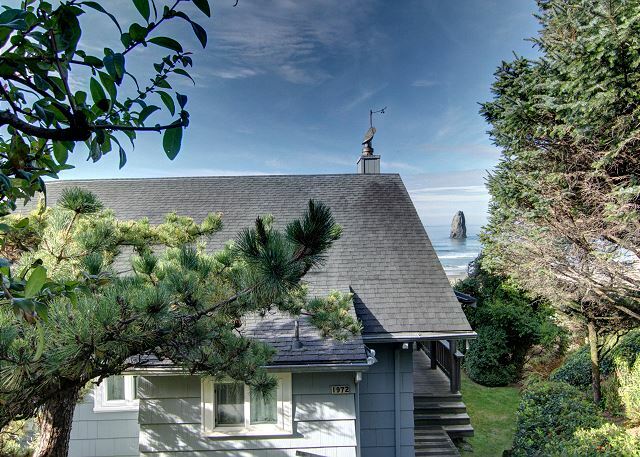 The house has a spectacular view of Haystack Rock. A bit of a walk into town, but a short drive. We were able to sit on the deck one day, which was a gift in late October. The house is well stocked and the bathrooms have recently been renovated. We hope to be back soon!" "wish check in could be earlier, and check-out a little later"
"Wonderful!!! 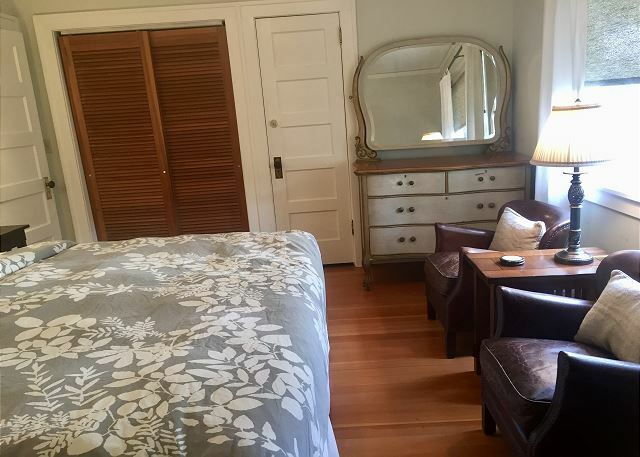 Aesthetic, warm, fabulous location, and well provisioned!" "Would have liked outdoor eating area"
"Holy Pottery Barn, Batman! After thinking about this for most of the week, the decision is to tell all those who visit this site, this property is magical. It's "vibe", as my daughter put it, is"amazing". Interpret that as you wish. We have been working through CBPM for five years and I can only say the person who had a bad experience with the staff at CBPM must have been in a bad mood that day. They have been gracious and helpful given very good advice when we sought it. This property and this property management company are wonderful. If I owned a property here, CBPM would manage it. In the meantime, we have debs on the week around 7/4 (unless the Neilsons want it, of course)." ".ll arof noitacav suolubaf a dna dna eniw taerg ,rehtaew lufrednoW .tnemeriter tnecer s'eno etarbelec ot emac sdneirf evif"
"Everything was great, we definetely want to return later. I could not mark an answer on your questionnaire but all the answers are 5=very satisfied."